SDL is a global language and translation technology provider that supplies CAT (computer-assisted translation) software to a staggering number of translators and LSPs across the globe. SDL’s solutions facilitate translation, management and terminology tasks, significantly boosting translator and project manager productivity, and are invaluable in today’s competitive market. 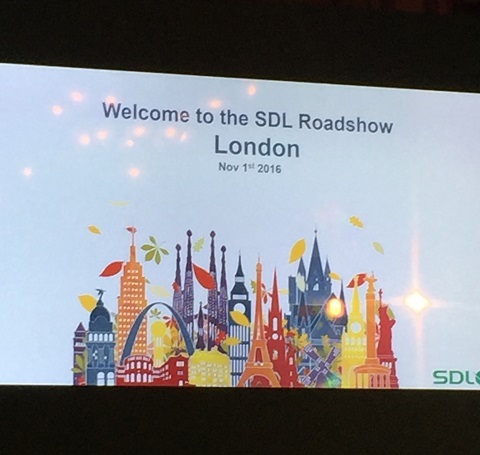 The team at LK Translations use SDL solutions such as Trados Studio and Multiterm on a daily basis, so when Translator Roddy got the chance to register for the SDL Roadshow 2016, an event in London showcasing cutting-edge technologies from one of the world’s leaders in the industry, he jumped at the opportunity. On Tuesday 1st November 2016, Roddy once again hopped on the train to the capital eager to see how we could implement the latest SDL solutions into our day-to-day workflows and, in turn, pass these benefits onto our customers. After a general presentation about SDL’s 2017 releases, the cohort split off into two streams: one for beginners and one for advanced users. As members of the LKTeam are all seasoned users of CAT tools, Roddy joined the advanced session in which participants were given detailed explanations and demonstrations about how they could capitalise on these ground-breaking technologies. We can’t wait to use all of the new, productivity-boosting features and are eagerly looking forward to Trados Studio 2017’s imminent release. Click here to find out about how we use CAT tools to the benefit of our customers.